Borås is Sweden’s 13th biggest municipality with around 110,000 inhabitants. 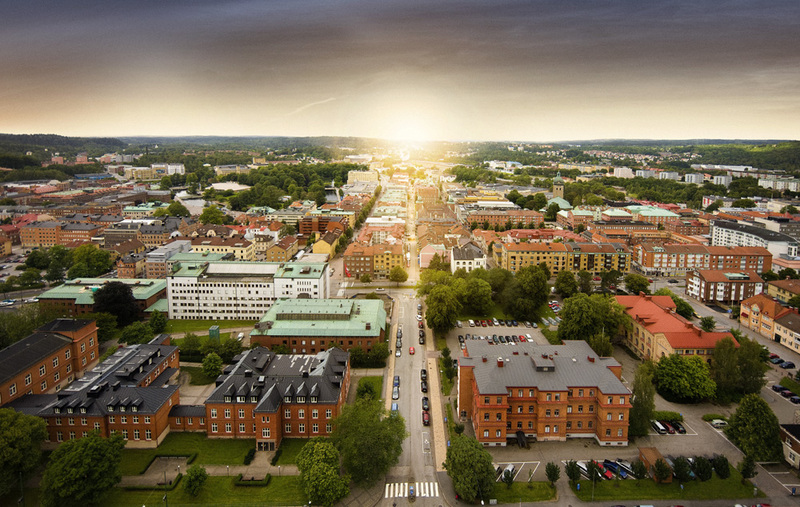 No less than 1.5 million people live within a 100 kilometre radius of the city, itself a centre for the 280,000 inhabitants of the Sjuhärad area. Borås combines all the wealth of choice of a big city with the convenience and closeness of a small town. Borås is the Swedish centre for textile design. The Swedish School of Textiles and the Nordic School of Design are Sweden’s leading schools for the textile designers of tomorrow. Many famous textile, clothing and fashion companies originated here. Oscar Jacobson, Eton, Borås Cotton, Gina Tricot, Nelly, Svea, Hemtex, 8848 Altitude, Abecita AB and Almedahls AB are a few of the companies and brand names associated with Borås. Borås’ position as a leading city of commerce, with its 1,500 import and export companies, has evolved from a long history of traders and textile producers. The city has for many years been a hub for mail order and e-commerce. Companies such as Ellos Group, Cellbes AB, Halens AB and H&M Rowells are the source of millions of packages sent from Borås, making it the centre of mail order in Scandinavia. This is why Borås has a more extensive foreign trade than places like Hong Kong. Borås has during the recent years become one of the leading Swedish cities for public art, with many sculptures and murals by both Swedish and international artists. The most famous sculpture is the nine-meter-high Pinocchio statue, “Walking to Borås” by Jim Dine. The city has for several years been the focus of the street art festival No Limit, an art event where international artists gather in the city to turn the public space into an outdoor exhibition. The large scale murals are dotted around the whole town, available for anyone to see and visit anytime. Borås has an extensive and exciting cultural sphere, full of colour and life. In addition to the public art installations and murals, the city offers space for many interesting cultural happenings at the city theatre and museums. Among these are Borås Museum of Modern Art, where exhibitions interchange every other month, and the Textile Museum of Sweden which tells the story of the city’s history in textiles as well as showcases new innovations and breakout artists. There is also Abecita Museum of Modern Art situated in the heart of Knalleland, which offers a mix of history, photography and graphic art. The city is embraced by parks and green areas, stretching into the urban areas. The beautiful countryside is always within easy reach. Rya Åsar is a nature reserve close to the city that offers 5 square kilometers of wide open nature and breath-taking views. Borås is surrounded by recreational areas that give you easy access to forests, lakes and trails. These all make for good starting points for hikes and other outdoor activities. Borås Zoo was founded in 1962 and was the first of its kind with different species roaming free together. There are more than 600 animals of 65 species in the park. The focus is on big African mammals, but there is also a wide variety of species from Europe and Asia. Navet Science Center offers experiences in natural science, engineering and mathematics for all the senses. A great opportunity for knowledge combined with great fun for the whole family.